The answer to your question, Dom, is another question: Have you been good about installing Windows updates? Because when Microsoft released Vista Service Pack 1 back in 2008, it included a recovery-disc builder very similar to the one bundled with Windows 7. 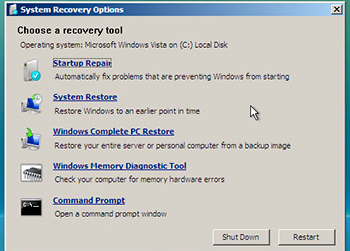 To see if you have it, select Start, All Programs, Maintenance, Create a Recovery Disc. Then just follow the instructions. And what about XP users? Your best bet is UBCD4Win, a free boot-CD creator that provides a wide variety of tools for repairing Windows. The Windows System Tray is something of a necessary evil. It shows status icons for various system elements (like volume and network connections) and programs running in the background like your anti-virus software. You'll probably want to experiment with different settings for different icons. For example: on one hand, I don't want the Windows 7 Action Center icon cluttering up my Tray, but I do want to hear from it when there's an issue--so I've set it to Only show notifications. On the other, I routinely use the Control Center 3 software that's tied to my Brother multifunction printer, so it's nice to have that icon at the ready. The setting: Show icon and notifications.